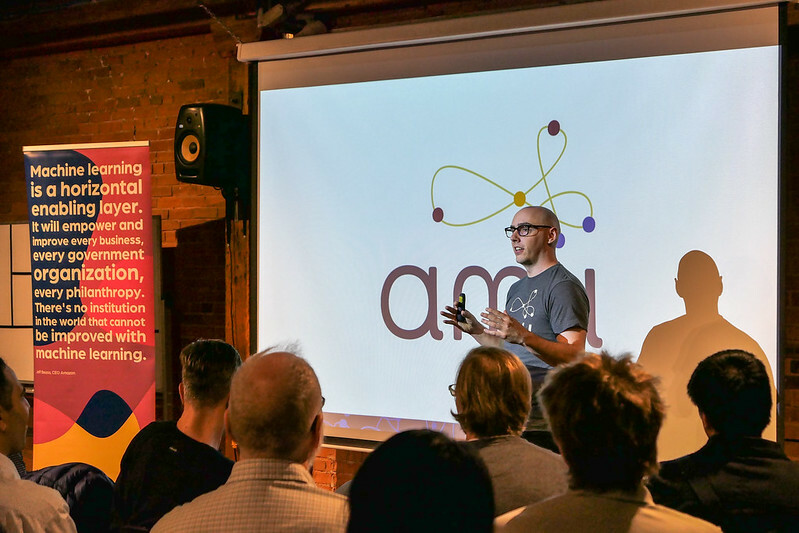 The Alberta Machine Intelligence Institute (better known as Amii) held its first AI Meetup at Startup Edmonton on September 10. 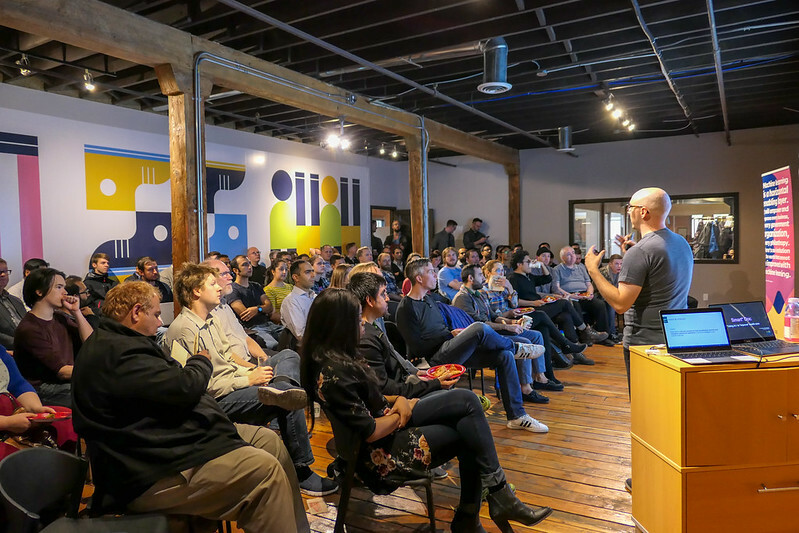 The organization has been hosting “Tea Time Talks” and other small events at the University of Alberta for a while now, but the new AI Meetup is an attempt to reach a broader audience. Judging by the turnout to the first event, they’re on to something! Melissa Woghiren, an Amii grad student, was one of two speakers at the packed event. She spoke about her work using machine learning to assist physicians in the timely diagnosis of stroke. “No one cares about the algorithms,” she said. “They care about the ML tools, generally speaking.” Melissa dazzled the crowd with details on what AI can do now to detect stroke and heard attacks, but also discussed the risks of algorithmic bias. Her take home points were that AI can be useful in medicine, we care more about the ‘what’ than the ‘how’, and the goal is not to replace doctors but to assist them. After the talks, there was an opportunity for questions as well as a DemoCamp-style call for anyone in the room who is hiring. 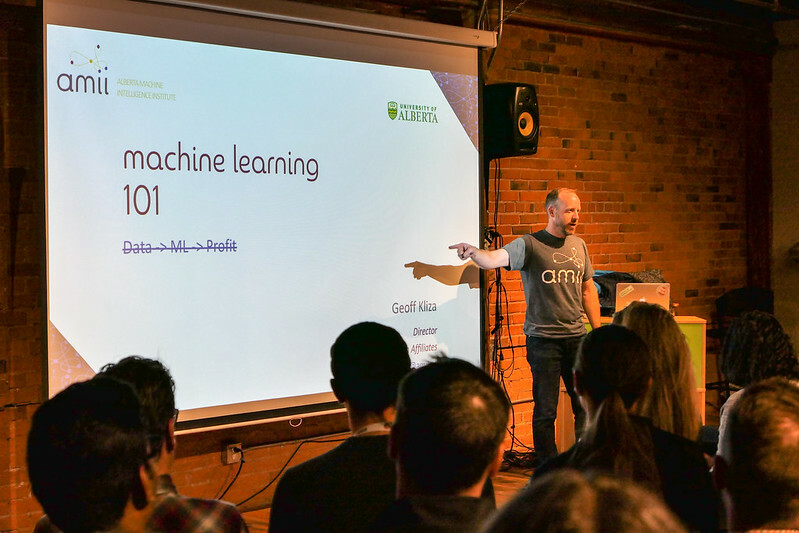 Just a few days later Amii held a Machine Learning 101 meetup at Startup Edmonton and once again the event was standing room only. Geoff Kliza, a Project Manager at Amii, delivered a modified version of an ML101 talk he has given to dozens of organizations recently. Here’s my Twitter thread from the event. “You don’t have to work with our 14 world-leading researchers” to use ML and to do it well, he started. Geoff talked about how the cost of prediction is getting cheaper thanks to cheaper computing power and storage, and more efficient algorithms. A common question that comes up is how AI relates to ML, data science, and other terms, and he showed a great Venn diagram to help explain it. He also defined some common terms in AI such as unsupervised learning (learning about your data), supervised learning (learning from examples), deep learning (neural networks), reinforcement learning (learning via experience), and transfer learning (learning from analogous situations). Geoff also shared 8 key takeaways reinforcing similar points made at the AI Meetup, including that machine intelligence projects often involve very little ML, that data changes destroy models, that no one cares about your algorithm only what it can do, and that machine intelligence and humans work best together. On that last point he shared the example of metastatic breast cancer diagnosis. Doctors are about 96.6% accurate and machines are about 92.5% accurate, Geoff said. But together, they are 99.5% accurate, which is an 85% decrease in the human error rate. That’s the power of working together. 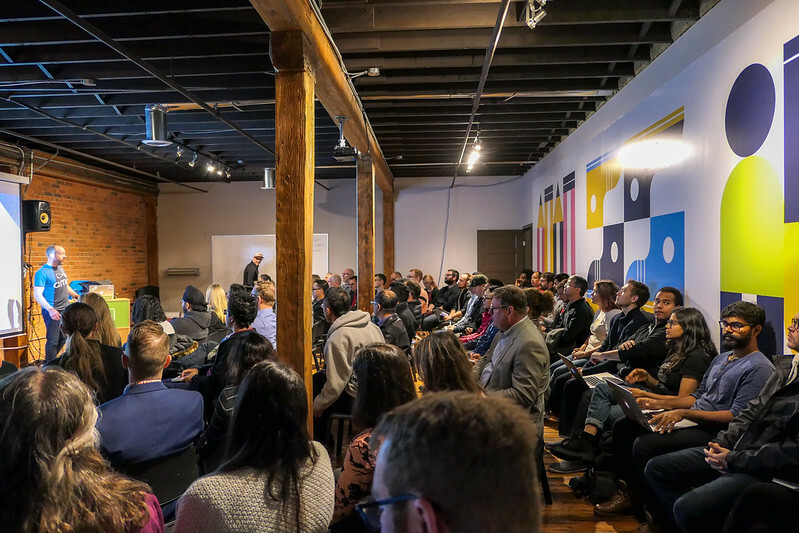 For the latest local AI and other tech news, subscribe to Taproot Edmonton’s Tech Roundup.